One of the most important aspects of diabetes treatment and management is a healthy diet. Since diabetes is caused by your body's inability to produce insulin, which helps your body turn sugars into energy, your diet may have to change. The most important thing will be to eat a variety of foods and limit your intake of sugars and starchy foods, which turn to sugar in your body. Pastas, white bread, and potatoes are starchy foods that will need to be limited in your diet - but there are many recipes for foods, even desserts, that are diabetic friendly and allow you to enjoy the food you eat. Preheat oven to 350 degrees. Spray an 8-inch square baking pan with aerosol spray. In a bowl, beat together the egg, peanut butter and banana until smooth. Beat in the milk and flour, baking soda and powder, and stir in the peanuts. Spread the batter evenly in the pan. Bake for 30 minutes until browned. Cool and cut into 25 squares. Place all fruit (except bananas), juices and liqueur (if using) in a large bowl. Add sugar substitute (if using). Gently mix. Cover bowl and refrigerate 4-8 hours - but, no longer. Just before serving, stir in banana slices. In a small bowl, combine the mayonnaise, soy sauce, sherry, ground ginger, and pepper. Set aside. In a separate bowl, combine pasta, chicken, snow peas, green onions, and water chestnuts. Add dressing mix (step 1) and toss. Refrigerate overnight. Sprinkle with toasted almonds before serving. 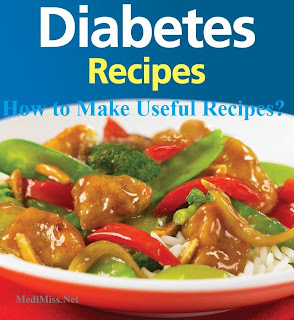 Many people with diabetes eliminate spaghetti from their diet because the spaghetti noodles are a starch food and because most prepared spaghetti sauces contain sugar. This Spaghetti sauce allows you to enjoy spaghetti without the guilt - and if you use wheat noodles, you can really enjoy a guilt-free meal. Cook all ingredients in a covered saucepan until sauce thickens. Add bean sprouts, and then simmer 10 minutes. Serve over cooked pasta noodles. A Healthy Diet in DiabetesA healthy diet is the most important part of your diabetes treatment. You can find these and other diabetes recipes in books and on the Internet. Be sure that you eat a healthy diet and exercise regularly to help in the management of your diabetes and for your overall health.